Caramelised red onion marmalade/chutney. Winner of numerous awards including Gold at the Great Taste Awards. It is slow cooked to our own recipe to a marmalade consistency. A great favourite with our customers. 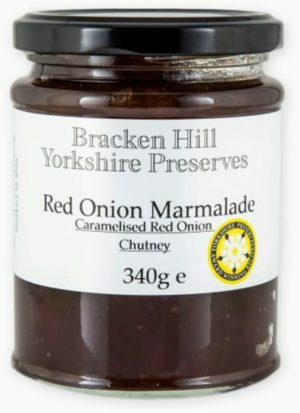 Tried this for the first time having had lots of other bracken Hill products and it is wonderful underneath the sausagemeat in sausage rolls. Red Onions 68%, Sugar 17%, White Wine Vinegar 8%, Balsamic Vinegar 5%, Sea Salt, Spices, Chilli.